Tonight, DJ Deej and DJ Winks were in the studio for more radio fun, and More Life. Yes, the moment that we’ve all (especially Winks) have been waiting for, came on March 18. Within 24 hours, the playlist by Drake and the rest of the October Firm received nearly 90 million streams worldwide. “Passionfruit” was overhyped on social media prior to the album actually dropping. Both DJs expected a club banger, but instead received a chill track. This is not a complaint, just a bit of a surprise. “Can’t Have Everything” – Deej has come to the conclusion that its beat is just “Successful” (ft. Trey Songz and Lil’ Wayne) sped up. “Try reciting the chorus of “Successful” over it and see what happens,” she said. 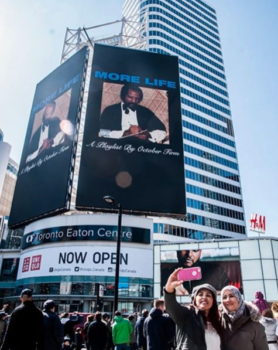 However, the ending segment was reminiscent of “Look What You’ve Done” off of 2011’s Take Care; a welcome and pleasant nod to the Drake of the past. “Teenage Fever” is relaxed, but a lazy sample of “If You Had My Love by Jennifer Lopez. Totally explains why she and Drake were hanging out all the time though, if anything. “Lose You” and “Portland” are definitely the bangers on the album. a) St. Paddy’s 2017 — Laurier’s celebration set a record with an estimated 12 000 people on Ezra Avenue. 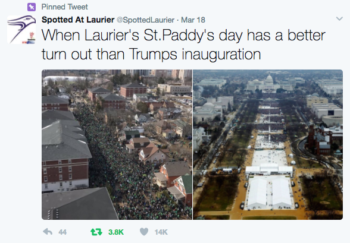 The Spotted at Laurier tweet comparing the street gathering to Donald Trump‘s inauguration has received nearly 4000 “retweets” about 14 000 “likes” on Twitter, and nods from people like Andy Lassner, the Executive Producer of The Ellen Show. b) Nintendo Switch (?) — This fall, DJ Winks is moving away from home for the first time. He really wants to get his own TV and a game console for his new pad. He’s in the process of doing research, but cannot seem to decide between the new Nintendo Switch, the XBOX One S, and the PS4 Pro. We have put out a poll on Twitter to (hopefully) ease the decision-making process. c) Two more shows??!! — We’re looking to do an all-request segment next week. Please Tweet us any requests, or write on our Facebook line (both @RLAfterClass). Watch our IG for prompts and in studio action. You can follow us @afterclazz.